Turin Epicurean Capital: Sanam Lamborn guest post! Please, enjoy this guest post by Sanam Lamborn, publisher of My Persian Kitchen, a website dedicated to the cuisine of her birth land, Iran. As a passionate and creative cook much of her inspiration comes from having lived in Iran and Italy. She believes that the best meals are prepared with fresh and healthy ingredients. Sanam holds a BA and MA in English in addition to a Professional Cooking Certificate. While not cooking in her kitchen or blogging, Sanam teaches college level writing and oral communication classes. A couple of years ago while visiting my parents in Rome for the holidays, my mom surprised me with a homemade Osso Buco and Risotto Milanese lunch after we had seen the recipe in one of my favorite Italian magazines. This was certainly a treat as these delicacies are not part of my mother’s regular repertoire. There was something magical about that meal because it was the epitome of my two culinary worlds deliciously colliding together. On a creamy bed of brightly orange Milanese Risotto, made with Persian Saffron, sat a perfectly tender Osso Buco finished with a sprinkling of Saffron Salt purchased from Castroni. My great uncle, my maternal grandmother's brother, was stationed in Rome as a diplomat in the 1960s. His love for this beautiful country was passed on to both my mother and her brother. In fact, my uncle chose to attend University in Rome, and my mother married an Italian man after my parents divorced. While I was born in Tehran, Iran, I was fortunate enough to have spent my formative years in Rome. The Italian culture, cuisine, and landscape hold a very special place in my heart. While in some aspects the cultures of these countries can be somewhat similar, the cuisine could not be any more different. For example, the majority of Persian dishes are served with rice. Conversely, in Italy pasta takes center stage. Persian dishes use various spices and are labor intensive. In contrast, Italian dishes develop their flavor from simpler preparation and in many cases minimal ingredients. However, there is one spice where these two cuisines find commonality: Saffron. In the cuisine of my birth land, Saffron holds the crown jewel in terms of spices. Many Persian main courses masterfully combine the flavor and color of Saffron with other popular spices. Additionally, many sweets incorporate Saffron; the taste provides a delicate balance with other spices, while its color delivers a magnificent shade of orange to each recipe. In Persian cooking Saffron is mainly used in its liquid form. It is safe to say that the original chefs of Persian cuisine not only found a way to stretch the proverbial dollar, when consuming Saffron, but they also found a way to maximize its flavor. Persians simply pulverize Saffron threads with the help of a dash of sugar; then they steep it in the same manner that one brews tea. The hot water helps extract and maximize the flavor of Saffron. This beloved liquid gold is then used spoonful after spoonful as needed. In contrast, in Italian cuisine Saffron is used in select recipes. Traditionally, Saffron threads were often used whole, however, in recent years it has become available pre-ground in small packets. The first dish that brought the realization that Saffron is used in Italian cuisine was Risotto Milanese. I found myself immediately drawn to this dish, not only because of its delicious taste, but also because of the unique cooking technique used when preparing risotto. Just like making Persian rice, risotto making is a labor of love that requires patience and careful attention. There is something extraordinary that happens when a ladle of warm broth, infused with threads of Saffron, is added to the bubbling pot of rice at the precise moment when each grain has absorbed every bit of liquid from the previous ladleful. The aroma of the rice, broth, and most importantly Saffron offers a feast for the senses. There is no greater satisfaction in that moment than watching the color of the rice change into a gloriously bright orange hue. So one must wonder, how did Saffron make it to all the way to Italy from its birth place Persia? The answer is somewhat simple: the Silk Road. One of the culinary contributions that the Arabs brought with them during their sea travels to the West was indeed Saffron. Soon Saffron became the spice of choice for Italian nobility for both its culinary and medicinal uses. Italian farmers cleverly figured out how to farm this expensive spice from the Far East. The region of Abruzzi, in central Italy, to this day provides the best climate for the cultivation of Italian Saffron. 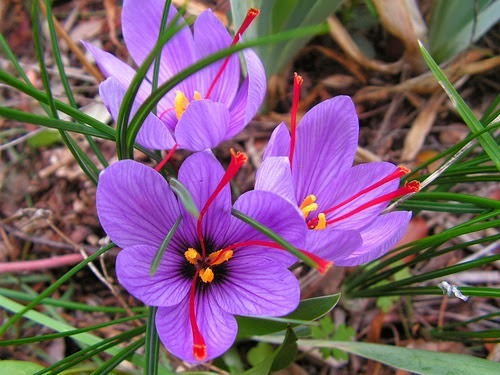 Today, Italian Saffron production has expanded to select other regions including the island of Sardinia. Saffron, besides being known for its deep orange color and delicate flavor, is also known as being the most expensive spice. The cost of this spice is directly correlated to the labor-intensive manner in which it is harvested and prepared for packaging. In fact, due to the delicate and careful manner in which Saffron must be handled, it is impossible to use machinery for its harvest. Saffron threads are found inside the Crocus sativus flower, which blooms in the fall. The harvest season is fairly short and can only take place during the early hours of morning. Each small purple bulb holds three threads of Saffron. Each flower is carefully harvested by hand; then, even more carefully, each flower is stripped of its three long red stigmas. When purchasing Saffron it is always best to acquire it in its thread form, instead of ground. It is also best to invest in brands that are reputable. Saffron purchased already ground can easily be mixed with colorants or even turmeric. Certainly, the taste and aroma will not be anywhere near the real Saffron. Always keep Saffron is an airtight container in a cool place. The brewed, or liquid, Saffron as used in Persian cuisine, should be stored in a glass bottle in the refrigerator and can be kept for up to a week. Wine Wed with Grignolino DOC!